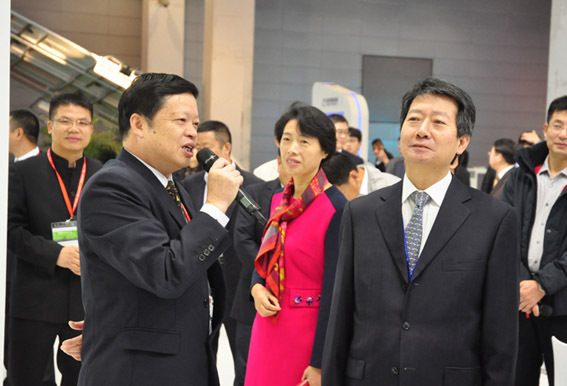 On the morning of Nov. 6th, 2014, at the exposition venue of the 6th CREC in Wuxi Taihu International Expo Center, the deputy director of National Energy Administration --- Liang Zhipeng visited Zhenfa New Energy’s exhibition booth with the company of Wang Quan --- the deputy secretary, mayor and pary secretary of Wuxi, Xu Huijuan --- the president of the organizing committee of Wuxi Promotion Center of International Economics and Trade, and other leaders. Liang Zhipeng, the deputy secretary of NEA listened to the introduction from Qian Zhongyan, the vice president of Zhenfa New Energy, upon the company’s development mode, business scope, and market layout and product modality with great interest. Liang showed his keen interest in the Zhenfa’s developing strategies such as the thousand miles of green electricity corridor in China’s east costal area, the green electricity corridor in west silk road, the desert transform and demonstration project in Zhongwei, the photovoltaic power station projects with the combination of tourism and facility agriculture, and the photovoltaic power plants at the intertidal zones along the coast. Meanwhile, Liang fully affirmed Zhenfa’s efforts in developing the overseas market and actively cooperating with the internationally well-known enterprises. He pointed out that as a domestically famous investment, development, operation and system integrator of photovoltaic power station, Zhenfa is to improve the technological innovation, actively explore and develop the distributed energy resources, and endeavored to foster and push the benign development of domestic new energy industry.